Hearts to the Rescue: Marietta, GA: Help them help Bandit! Marietta, GA: Help them help Bandit! Bandit was going to be put to sleep because his special needs required time his owner did not have. Julie, a young mother of a special needs child who also works as a vet tech reached out and took him into her heart and her home. Now Bandit is in pain and needs surgery Julie cannot afford. Please help them realize the dream of Bandit becoming a therapy dog while Julie's tiny son receives his own help to one day walk along side Bandit and his mom. "I would like to ask you for help. I know people probably ask you for help all the time, but please listen to my situation whole heartedly. I am a 31 year old mother to the most amazing special needs kiddo in the world. He is three years old, and our lives have forever been changed by him. He was born with a really rare genetic disorder that has resulted in global delays and he can not walk or talk yet. I have every faith though, that one day he will run and scream to his hearts content. To get to this though, he does therapy every single day. Our lives are consumed by doctors visits and we are in and out of therapy centers weekly. I am 31 years old and I have been a veterinary technician for the last 10 years. I love animals. We have 2 cocker spaniels, 2 chihuahuas, and 2 fat cats. A couple of months ago, an owner came into the hospital and wanted to put her dog to sleep. This sweet dog happened to be a black and tan 7 year old cocker spaniel. Now she wanted to put him to sleep because he had suffered a back injury leaving his back legs paralyzed and she just couldn't help him with all that was going on in her life. I had to step in. I was able to get her to sign Bandit over to me and she thinks that I am her guardian angel. We now have 3 cocker spaniels!! He loves everyone. He flew around my back yard with his homemade harness on his back legs holding his rear up when he went out for potty breaks. He was on strict restriction, so during the other times he was either in a baby play pen or on my lap on the couch. Bandit is the most loving seven year old cocker spaniel I have ever met in my entire life. He came in to the vet because he was suddenly ataxic in the rear. 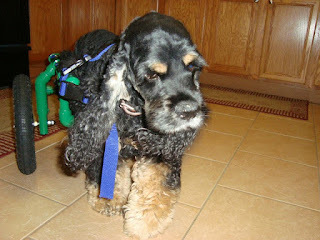 I took him home and by the evening he was completely paralyzed in the rear. I started walking him in a homemade rear harness and realized that he was doing great walking like this. 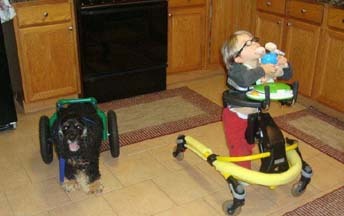 So about a month later he got himself some wheels from a very generous man at the Rolling Dog Project. He was doing so good.... Until the night before last. His vertebra L1 was now collapsed. Without surgical intervention he is going to be in pain. I am so heartbroken. I have only known this dog for a little over two months but he has touched my life in so many ways. We spend so much time in and out of therapy centers for our little boy. My hope for Bandit is that after his surgery and hopefully some recovery, that he can be a therapy dog. He loves everyone and would thrive on going to therapy centers and hospitals. Bandit was supposed to get his certification for Happy Tails on Feb. 16th to be a therapy dog. I really want to help him. This is an emergency. I work in a small animal hospital but they do not do spinal surgery. The specialist in the area will give me a 25% discount on the surgery, but we can not afford it. I already have a $700 vet bill at my animal hospital. I thought I was going to have to put him to sleep yesterday, but I just couldn't. I want to give him every chance I can. Please, please help us to help Bandit. I have created a Facebook page for him. Even if you cannot donate, perhaps you would share his page for me. Thanks for visiting and sharing The Bandit Fund. Since Cristian was born, I am only able to work a few hours a week at the animal hospital because he needs me more than anything. This has left us living on a single income, where we had 2 incomes when we purchased our home in 2008. Please let me know if you or anyone you know could help. If anyone would like to verify who I am and what I am trying to do, I work at Lassiter Animal Hospital in Marietta GA. If you care to donate anything at all, you can do so through Paypal to my email address above. Bandit and my family thank you for taking the time to read and for anything you can do.